I’m making Sun Bread with the girls today. Sun Bread comes from the children’s book Sun Bread, by Elisa Kleven. (Elisa Kleven has written many beautiful children’s books — The Paper Princess is another of our favorites. She lives in the San Francisco Bay area, and her illustrations always remind me of the time our family lived there). The story begins with a cloudy day, which is transformed when the baker makes Sun Bread and shares it with everybody. In the back of the book is a recipe for Sun Bread. 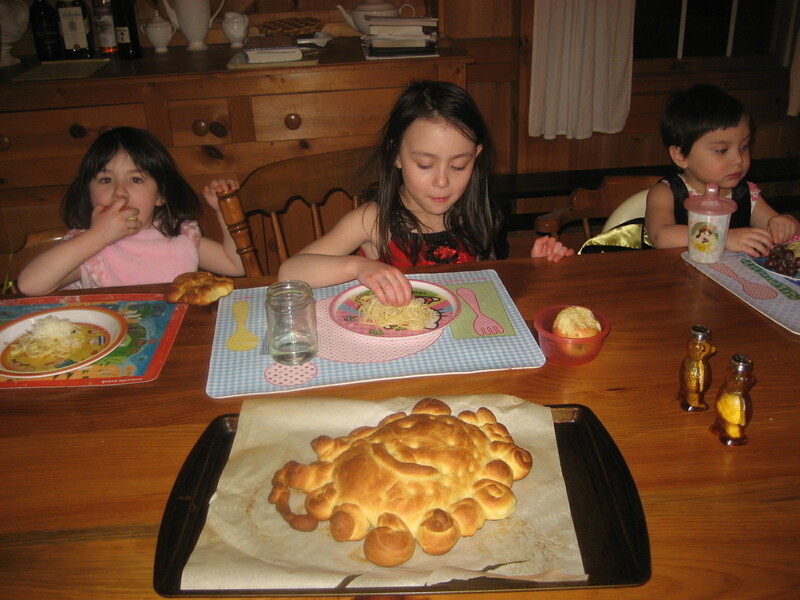 Sun Bread became part of our family culture because our daughters’ preschool reads it and bakes Sun Bread every year. Our oldest daughter loved the book and the bread, so I found the book in the library and xeroxed the recipe. Since we’re only halfway through preschool with our kids, I expect we’ll be reading and baking for years to come. I am not a person who bakes bread regularly, although I’d like to be. It’d been about a year since we’d last baked Sun Bread when, last week, my preschooler asked if we could make it. Since I’d like to be the kind of mom who bakes bread with her children, I said yes; because I’m not a person who bakes bread regularly, this required some preparation, like buying yeast. Given that the Sun Bread recipe comes from the back of a children’s book, I’m assuming it’s not difficult to make, as breads go. All the same, it involves a number of precise steps followed by a lot of waiting, so when I say “I’m making Sun Bread with the girls,” I’m not really making it with them. It’s still a little much for me to shepherd three young children through a major baking project while holding a baby. When “we” make Sun Bread, I make the dough during naptime and let it rise for an hour. Then the girls shape the dough into a sun (from whence comes its name), it rises for another hour, and I bake it so that it’ll be ready for dinner. Last week at naptime I dutifully set about making the dough for Sun Bread, and something went terribly wrong. Although I’d followed the recipe successfully several times before, this time the dough ended up a runny, lumpy mess. There was nothing to do but toss it out and admit that I’d wasted the better part of an hour (plus three eggs and an entire stick of butter). I promised the girls we’d try again this week, once I could get to the store and buy some more yeast. So today was Sun Bread, Take 2. I repeated the same steps as last week, and the dough again looked runny and lumpy. But this time I used my hand mixer to combine the elements, and within a few minutes I had soft, smooth dough. Which led me to the regrettable conclusion that, with a bit more patience and ingenuity last week, I probably could’ve salvaged that dough, too. Eight to 10 minutes!?!? I always think, WHO does she think I am?!? WHO has the time and endurance to knead bread for 8 to 10 minutes?!? I stewed about this while kneading, and after three minutes I’d realized that this is probably why I’m not a person who bakes bread regularly: It all comes down to commitment. I’d like to be a person who bakes bread regularly, a person who starts and completes crafting and sewing projects, a person who cooks new and delicious meals nightly, a person who journals daily, a person who exercises with some consistency. But I’m not. I do each of these things in fits and starts, with short spurts of regularity, but in the end my efforts fall flat. They all require too much commitment. It would be nice and tidy to file my inability to commit under the “I have four young kids” excuse. But I can’t do that with a clear conscience. The truth is that I was like this well before I ever had kids; it accounts for my difficulty deciding on a college major (biology to anthropology to psychology, followed by graduate school for both education and studio art) and my meandering path through post-college life (teacher to photographer to nonprofit manager to mother to distracted mom-blogger). Another truth is that I know plenty of mothers with young children who have absolutely no problem committing to a number of activities and pastimes. I suspect I’m not alone. Our generation expects things to be quick and efficient, and we’ve developed some marvelous tools to spare us the commitment required of past generations, who had to grow and cook their own food, sew their own clothes, handwrite letters and send them via mail, and track somebody down in person in order to have a conversation. But the tools that make our lives so quick and efficient have trained us to be multitaskers. We now expect ourselves to be able to talk with a friend, send an email, write a report for work, take a picture, supervise children, clean the house, and cook dinner — simultaneously. Multitasking is at odds with commitment; it’s trying to do many things in the shallow end, rather than one thing deeply. I’m not saying that past generations weren’t busy, or couldn’t multitask; I am saying that kneading a ball of dough for 8 to 10 minutes makes it difficult to do much else. Here’s what it’s easy to do while kneading a ball of dough: think. I thought about my commitment issue, wondered why all of my well-intentioned commitments kept fizzling out, and concluded that perhaps the issue is that I keep trying to multitask my commitments. I expect myself to commit deeply to baking, sewing, writing, exercising — simultaneously. Perhaps instead I need to commit to a commitment. Choose one thing and take it from there. No question: I choose writing. How about you? Great food for thought (no pun intended!)! Committing to ONE THING reminds me of Billy Crystal in “City Slickers” when the meaning of life boils down to “one thing.” Speaking of food from children’s books, the Vignes always make a “Happy Winter Fudge Cake” at the first real snow of the season. It’s from a book whose title escapes me! I think they made that cake too well this year cause winter has outstayed its welcome!